We know that millennials consume more online video than any other audience, and while they have been watching less traditional TV, they are spending more time watching video on their smartphones. We also know that video ads offer marketers an effective way to develop deeper relationships with younger audiences through immersive and engaging branded experiences from this recent study. 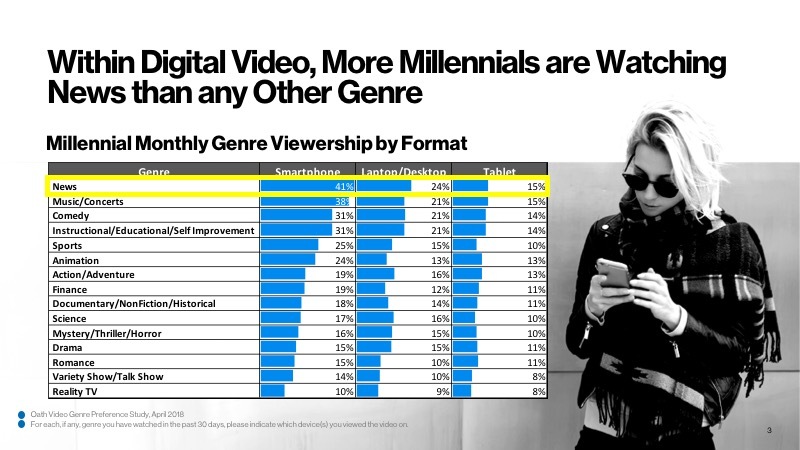 But what types of video content are millennials actually watching, and on what devices? 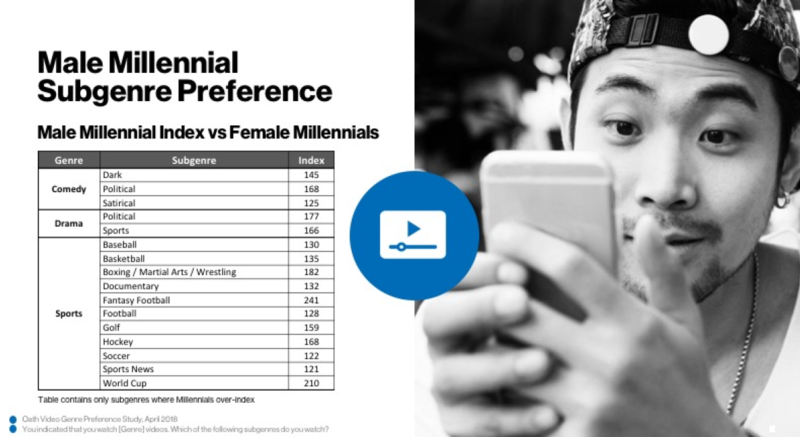 Our new Oath Video Content Preference study surveyed over 1,000 U.S. users ages 18 and over to give marketers a closer look at what millennials want when it comes to video. When it comes to alternative ways to consume video, other than traditional TV, smartphones lead the way. Smartphone viewership for nearly all types of video content, from reality to documentary, beats laptop/desktop and tablet usage. Furthermore, when it comes to concerts, live music, finance tutorials or content related to self-improvement, smartphone viewing is even more popular than traditional TV among millennials. Across all genres, millennials consume more content across smartphone devices than any other generation surveyed. This is especially true for videos in the comedy, action/adventure and romance categories. 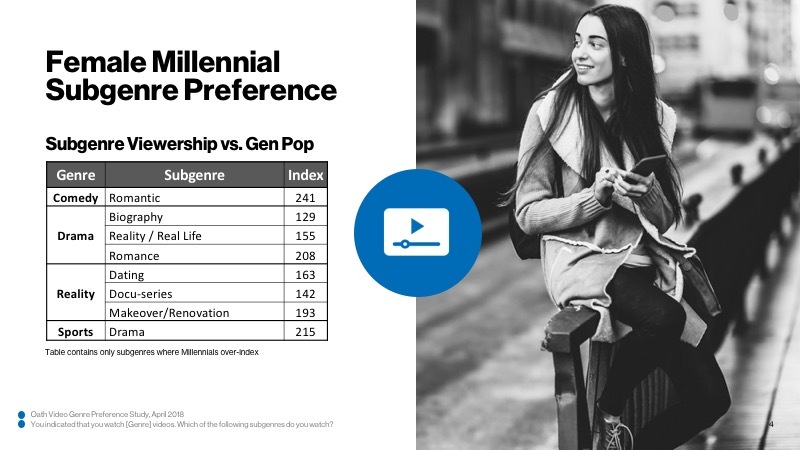 The chart below shows millennial video consumption vs. the gen pop (A18+) audience surveyed. The most popular type of video millennials watch? News. 81% of users say they watch news videos on a monthly basis and 1 in 3 say they watch news videos on their mobile phones. Both millennial men and women clearly love video content, but each gender shows markedly different preferences in the types of videos consumed. Millennial women are more likely to gravitate toward romantic comedies, romantic dramas and reality shows about dating than men. They are also more interested in reality video content. Millennial men over-indexed on comedy and sports categories. Those surveyed are far more likely to watch fantasy football, the World Cup and boxing, martial arts, wrestling videos, and are more interested in dark comedies. To learn more about how to target and engage millennials using Oath video solutions, visit our video page or contact us for more information.